I had a chance to spend some time at the Nikon booth during my stay at Photoshop World, and I took a tour of the new Nikon D90. Specifically, I wanted to see the movie mode in action. It's easy to use. You basically go to Live View, press a button, and the camera starts recording. You have to use manual focus, so I found it best to get the focusing the way I wanted before I started recording. I asked about image stabilization in movie mode. In other words, does the camera employ it if the user has an image stabilized lens mounted? I couldn't get a clear answer from the rep about that. He said he's waiting to hear back about it himself. The audio recording isn't great. But the D90 will pick up mono audio from an on-camera mic. You'll probably want to use a separate recorder and sync the two files together. But the video file looks great in all of its HD glory. My takeaway was that movie mode on the Nikon D90 is a strong opening salvo. 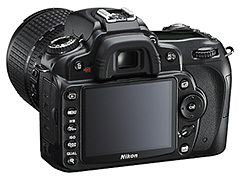 But there's lots of room for improvement from both Nikon and its competitors. It should be a fun and interesting 2009. Red is suppose to have a 3K Movie camera with digital stills. To commercialise in terms of high-performance rather than price, and in order to differentiate consequently, you require to follow the definitive format of the 4 Ps marketing plan. That is, Price, Product, Place and Promotion manifestly you recognise the bad properties of the product, and the cost, but for place you should remember approximately the type of individuals who are willing to give over 4x price of competing production whereas the cheap option may be sold where accent is on cost, your merchandise will be suited to places/distributors where the customers will be willing to pay for quality. Thank you for this article! I've just retrieved a truly true archive about seo advertising Test it!